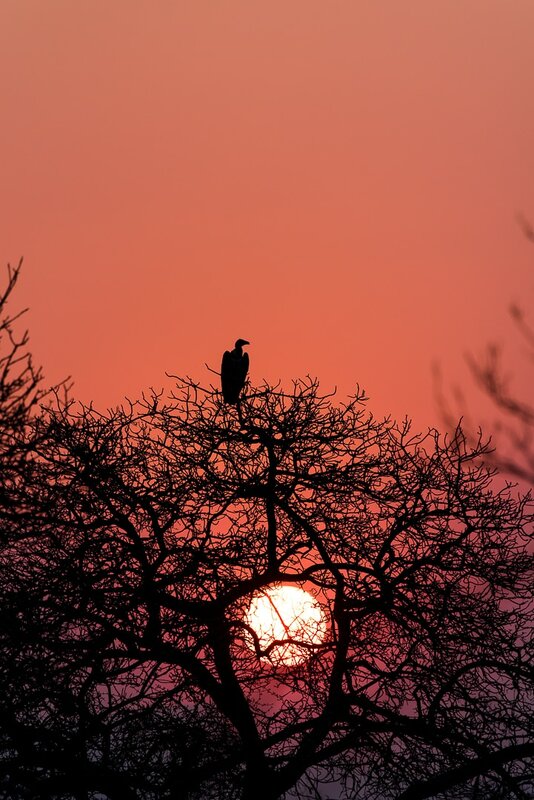 „I never knew of a morning in Africa that I woke up and was not happy.“ – Ernest Hemingway, US American writer. This is exactly what I felt. 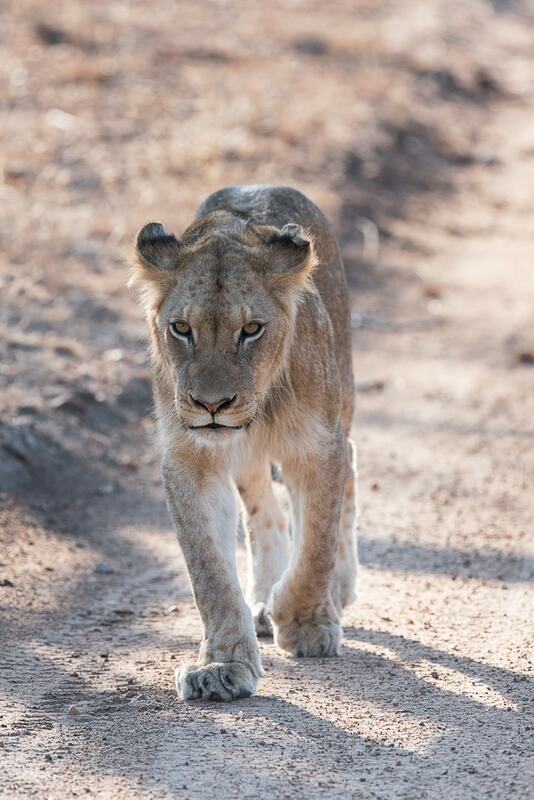 This year in September in the South African bush. 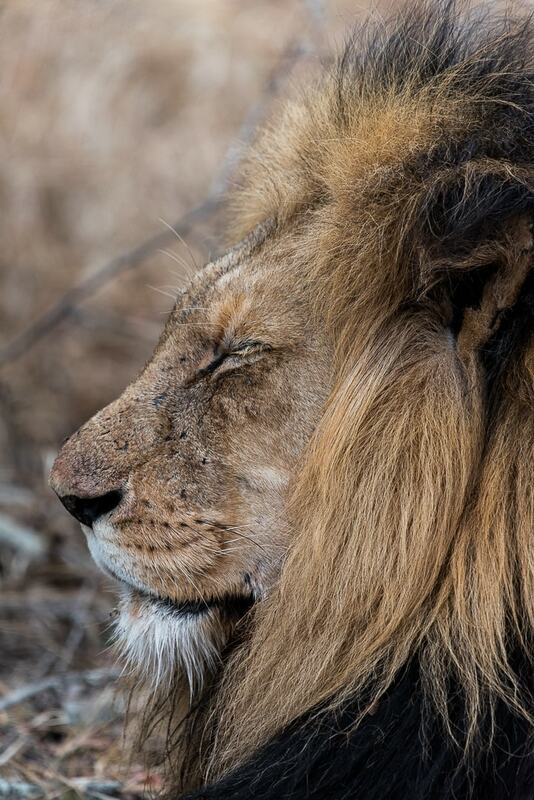 I can hardly describe this feeling to experience the wild animals of South Africa, yet I will try. For you, for me. This blog post is for all of us who dream, experience and reminisce. A gift. 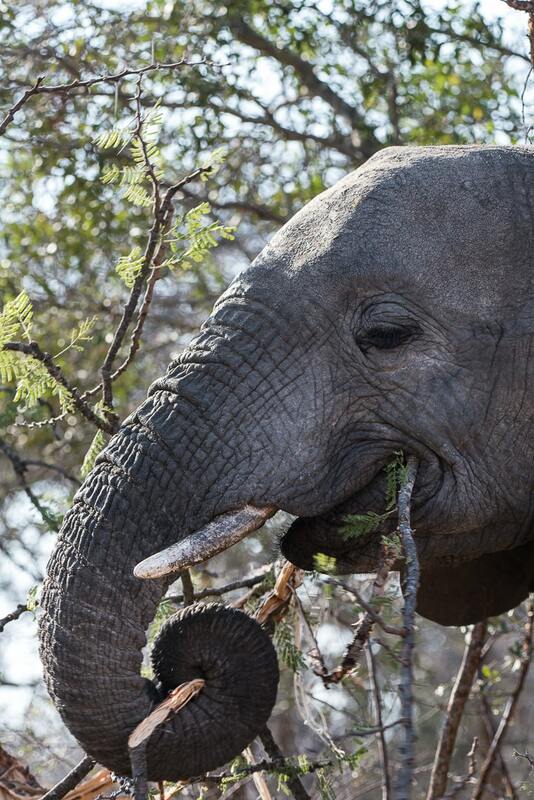 A small legacy to the breathtaking animal wildlife of South Africa. Do you know this wanderlust that accompanies you for as long as you finally get to the destination of your dreams? That’s what Africa is for me! Africa has changed me forever. I daily carry the impressions and experiences of my safaris with me. I daily plan my next trip. 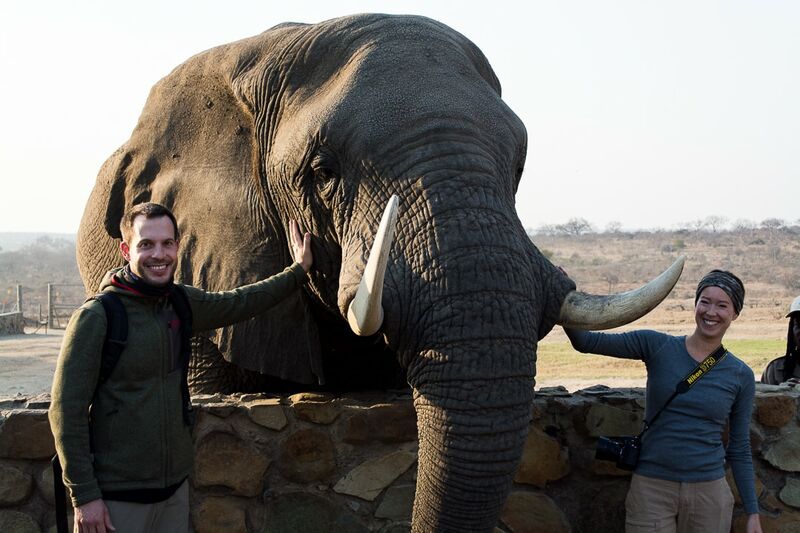 You want to know what it is like to go on a Safari in South African safari in a wildlife preserve in South Africa? 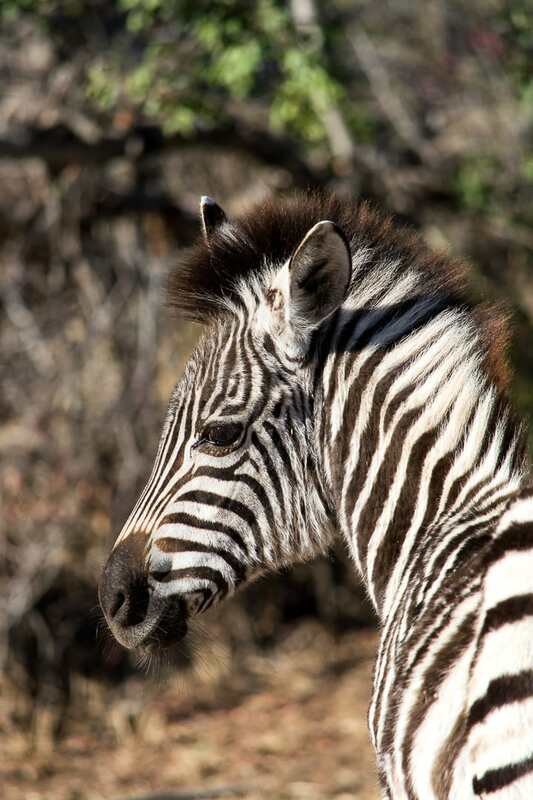 Gain experience and tips regarding the advantages of a luxury safari in the South African bush? Then you are at the right place at the right time today. 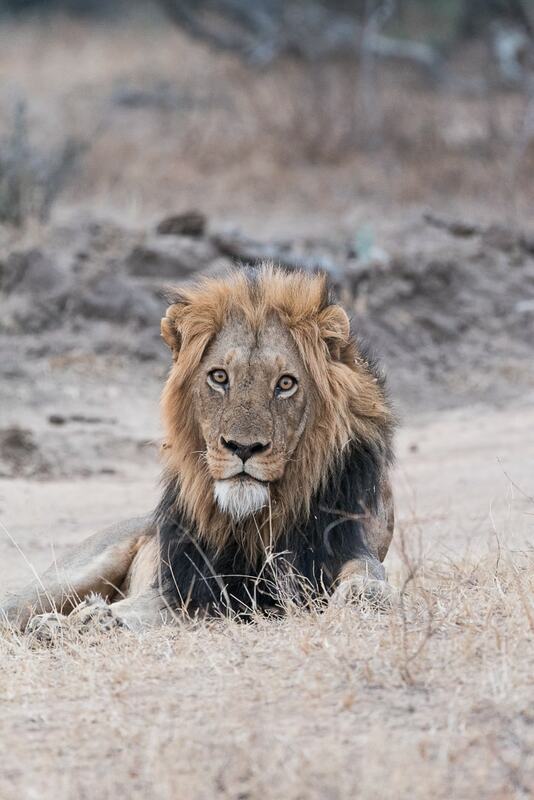 In this blog post I am sharing my adventures, pictures and experience of my 4th safari in the southern part of Africa with you. 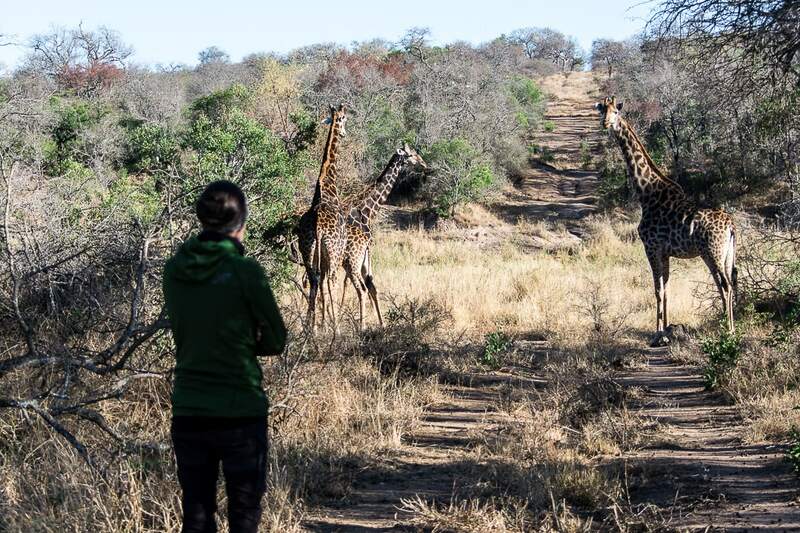 After giving you a rough overview of game drives, travel times, animal rights groups, flight, booking, clothing in my blog post „Going on safari to ones experience the big five close up”, I would like to share a detailed report about my experience in the wildlife preserve Kapama Private Game Reserve with you today. 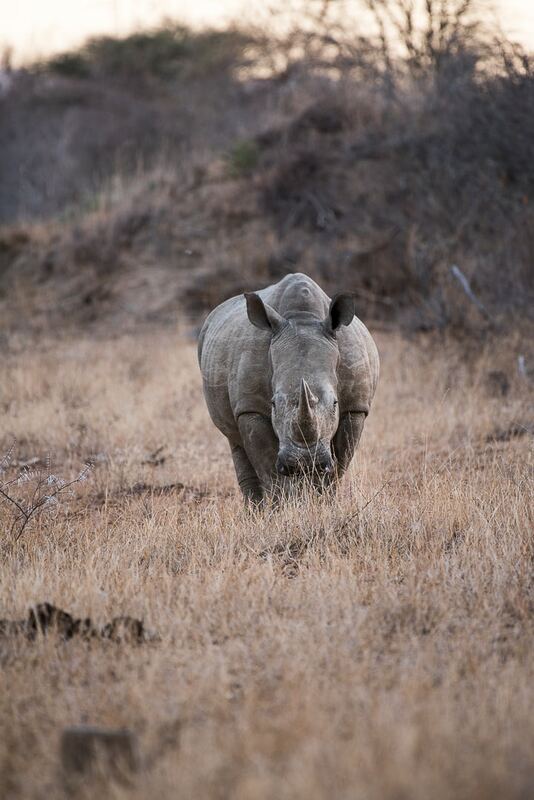 The wildlife preserve Kapama covers 13 000 hectares near Kruger National Park, home to 40 different species, among which are the Big Five: elephant, lion, leopard, buffalo and rhino as well as different species of antelopes. Additionally, there are more than 350 bird species. 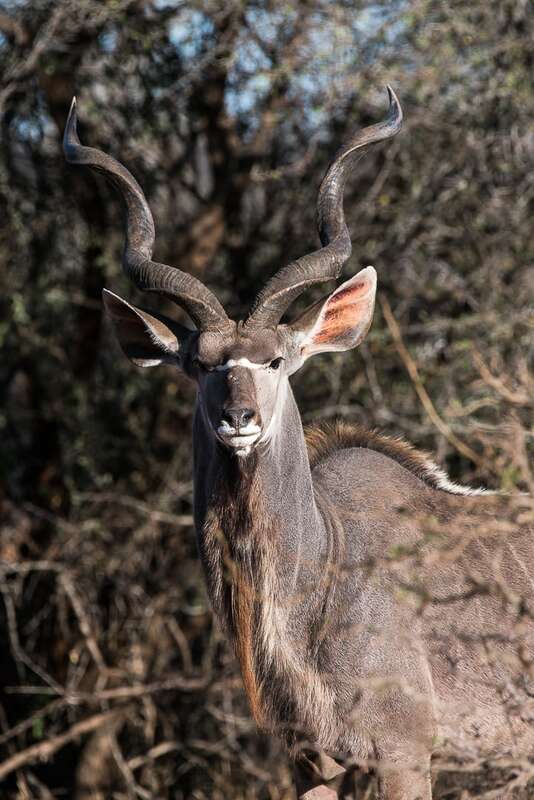 The Kapama Private Game Reserve has been a family business since 1989 and has ever since been the biggest one in the area around Kruger National Park. As it is a private reserve and one does not drive directly in Kruger National Park, one gets a lot of privacy with the animals. We have already got to know both and would always prefer a private reserve. My own feeling is that the animals have more privacy. In the national parks there are often more vehicles driving closely to the animal spot which can disturb the animals during their rest. In a private reserve there are only two vehicles allowed at one spot. 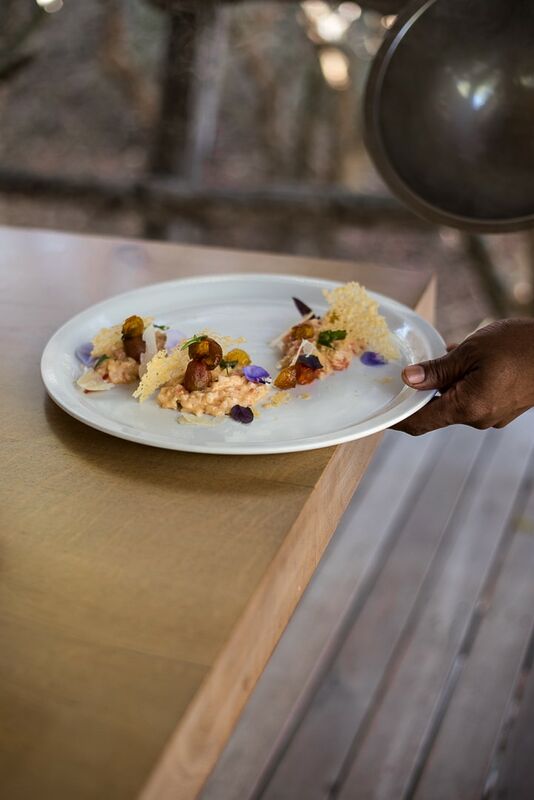 I would like to especially emphasise the exclusive cuisine of South African and of the Kapama Private Game Reserve which I will describe in more detail in “Kapama Karula | Cuisine on star awarded level”. The accommodation is very varied. There are 4 luxurious lodges. We have visited all of them in the last years. If you prefer a more rustic or a modern atmosphere, there is something in it for everybody. 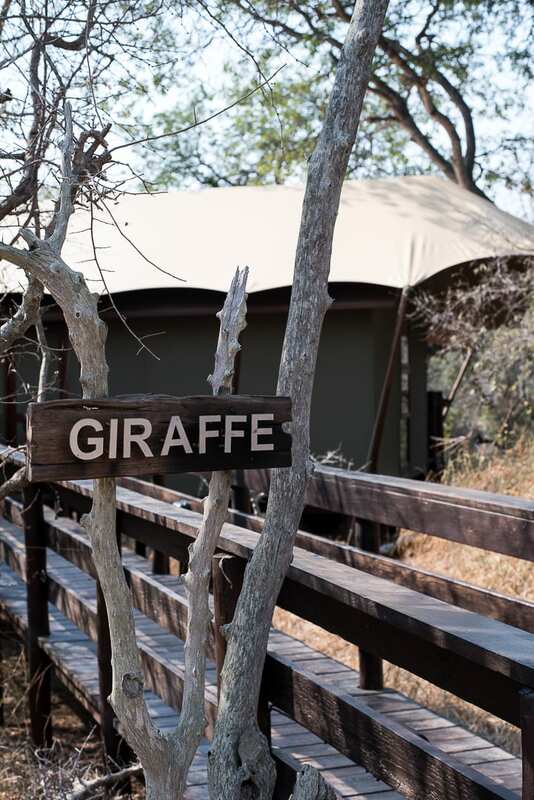 The lodges vary in size and spread all over the private game reserve. 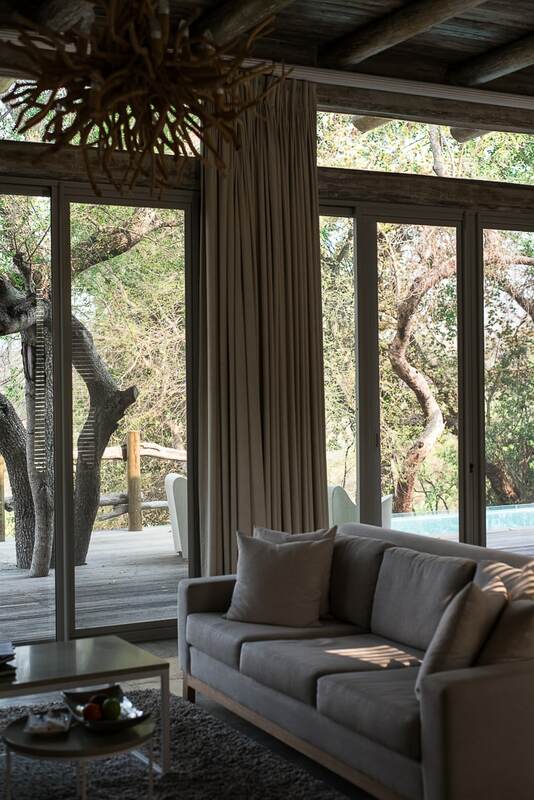 The beautiful thing about the location of the wildlife preserve is that one gets picked up by the shuttle service from Hoedspruit airport to the very closely located lodge which means less stress. 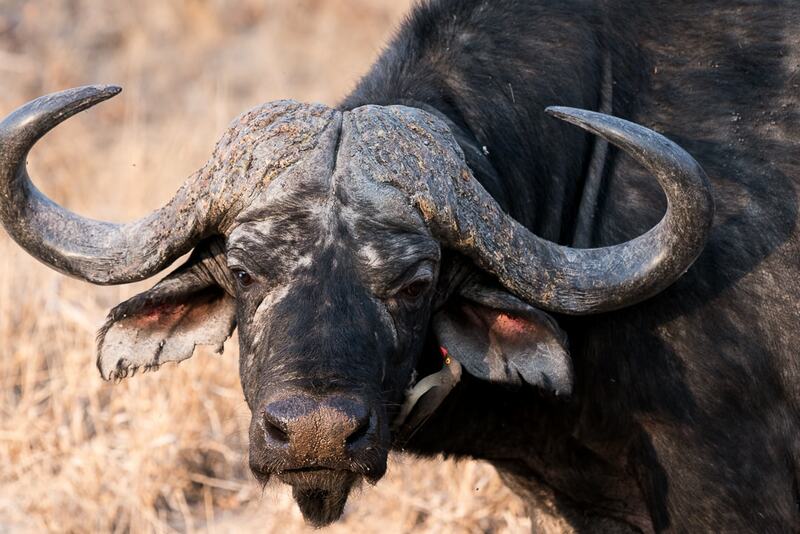 This year we spent three days in Buffalo Camp and an additional three days in Kapama Karula. I would like to describe both lodges in more detail. I was already fascinated by Buffalo Camp in 2017! It is furnished unbelievably beautifully and cosily and not very big. There are just 10 big luxurious tents available for the guests. They are situated on a higher level and are surrounded by nature only. It ist he most intimate, oldest and smallest accommodation of the wildlife preserve. We have enjoyed our stay very much. Especially in the morning hours when the sun is rising it is breathtakingly quiet and one can fully enjoy nature. A small swimming pool in the centre of the camp invites you to unwind and to cool down, if required. 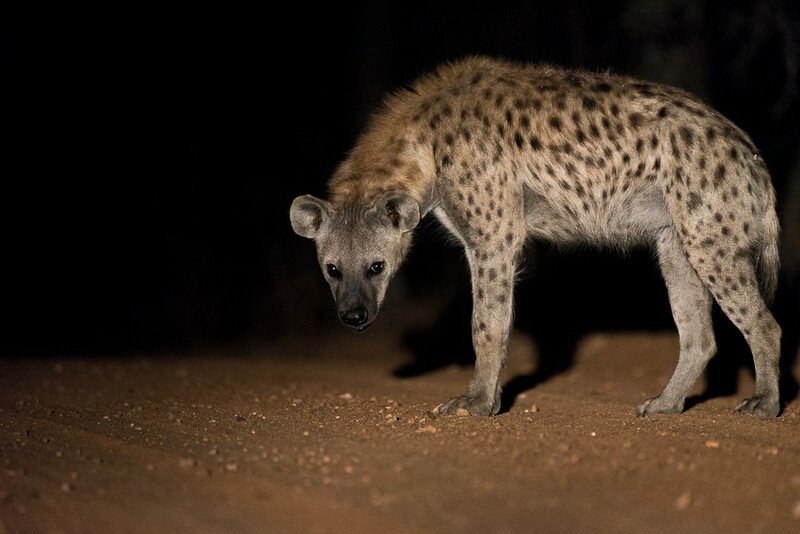 In the evening one dines in the restaurant or in the boma. 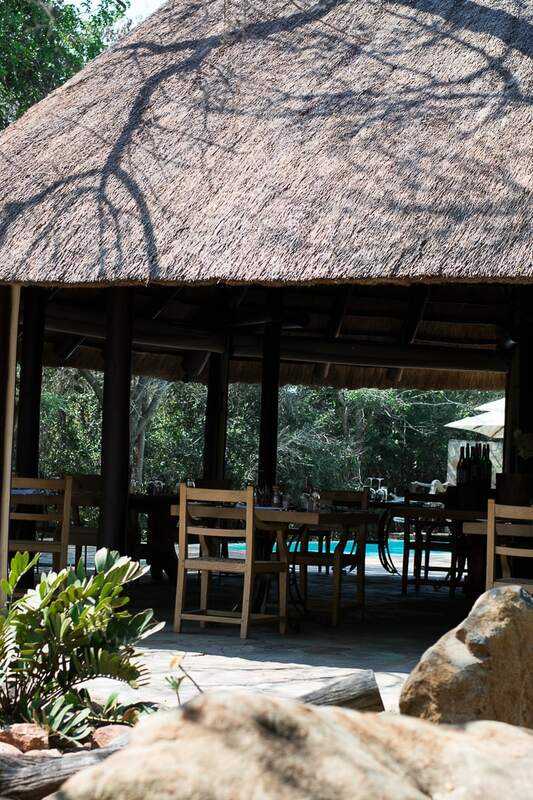 The boma is an area under the stars where you meet for a BBQ in a convivial circle. 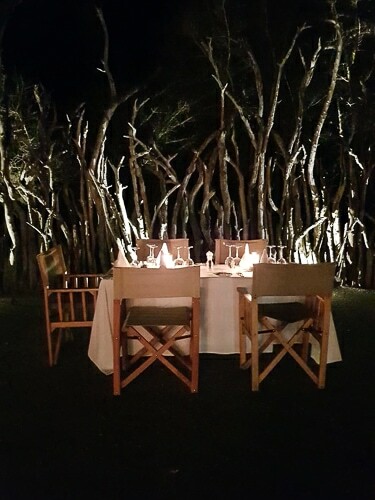 One dines at a big table together with the other companions from the vehicle of the game drives. These are always very special moments as one meets great people. Even the ranger takes part and tells exciting safari stories of his everyday life. In Buffalo Camp one can watch monkeys in the day and every now and then huge porcupines join you at the bar. 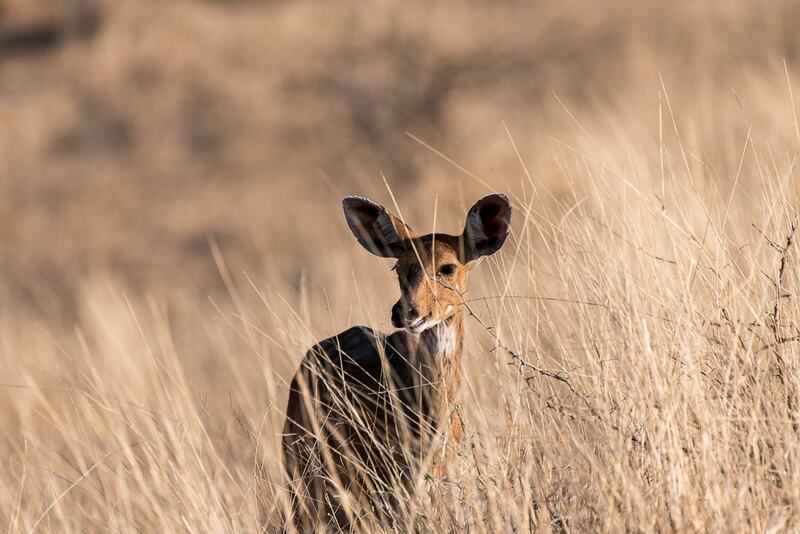 Everywhere you go you are surrounded by animals and the camp provides the necessary quietness to especially enjoy these amazing encounters. Elegance and naturalness at the highest level! Many thanks for your warm welcome, Sharice :-). 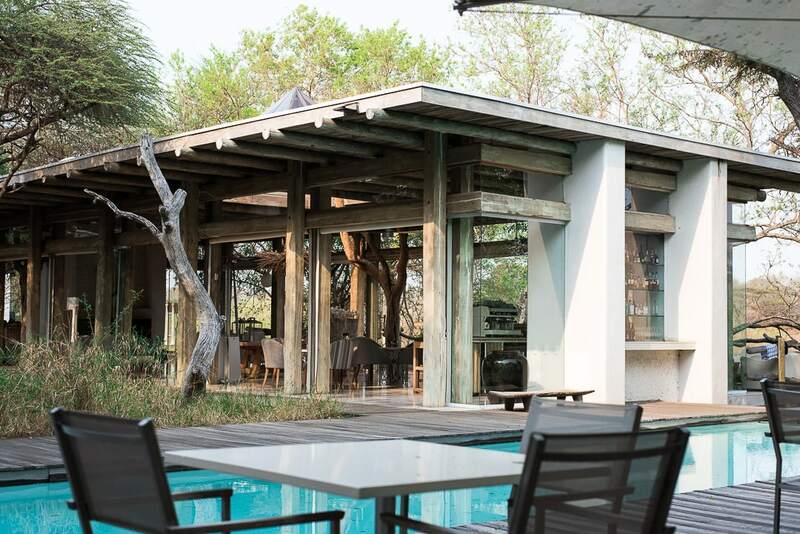 The Lodge is the second smallest one in Kapama Private Game Reserve. 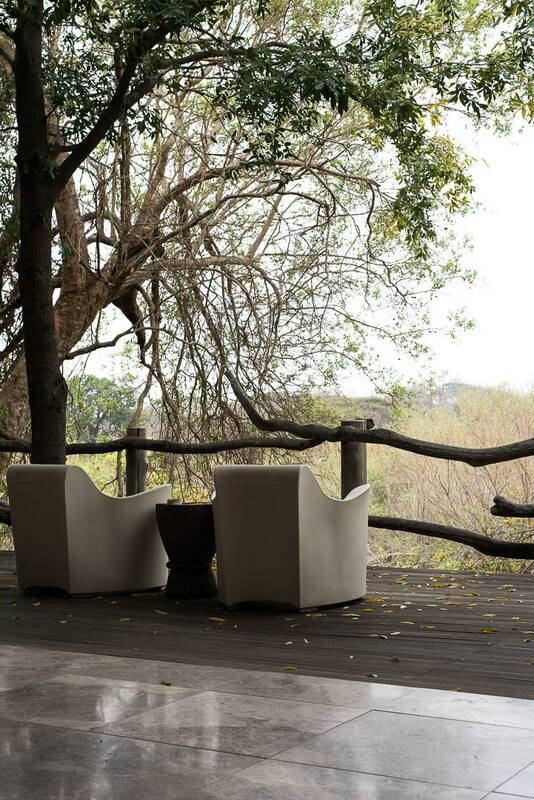 Next to the lounge, a bar, a library, a spa and a pool, there is a beautiful dining area with a view into the bush. In addition to the dining area, there is a boma with a fire place. No matter where you are, the complete lodge is unbelievably elegantly furnished and the staff is incredibly friendly. 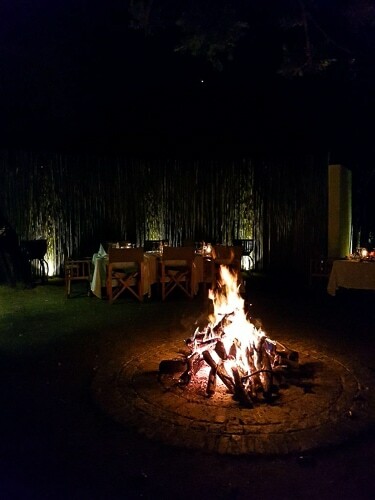 Here are some of the impressions of our BBQ in the boma. This evening we had a lot of fun with the other guests that came from all around the world. In addition to the fun and good conversations we enjoyed a great BBQ and traditional side dishes. There was a big variety of vegetarian dishes and the kitchen team especially prepared a portion without garlic for me so that I could eat everything. After a wonderful dinner, you can enjoy the luxurious accommodation. Each of the villas (Superior 90 square meters or Superior Family Villa 170 square meters) has an own terrace, an own pool and a lounge to relax. 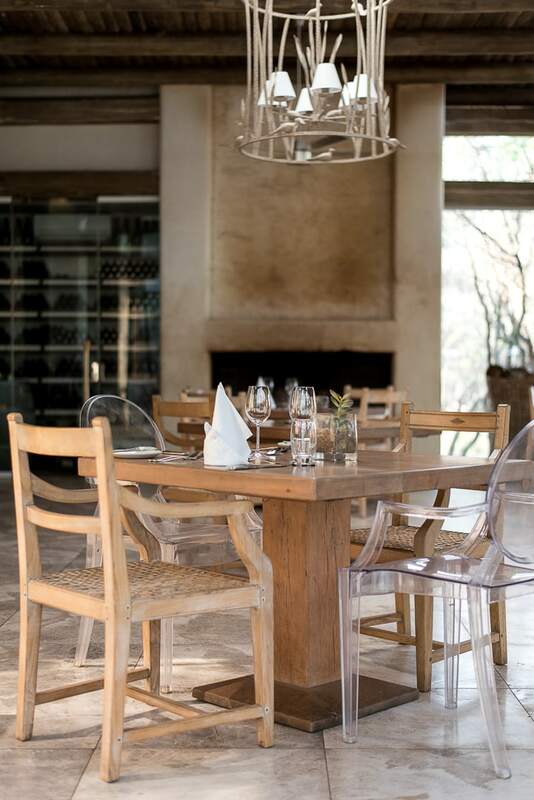 With a view onto the Klaserie River the location of the lodge is an absolute highlight. Since where there is water, there are the wild animals. 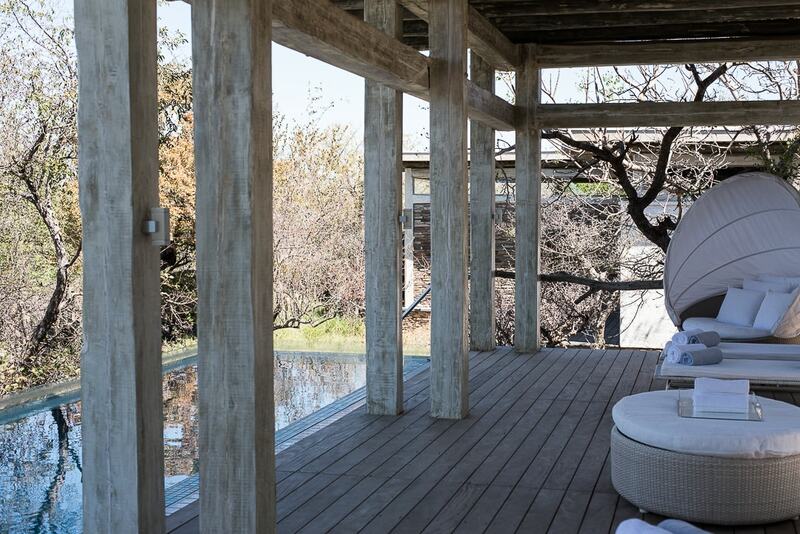 From the spacious terrace one can privately watch wild animals and birds. Every now and then monkeys come along and tease you ;-). 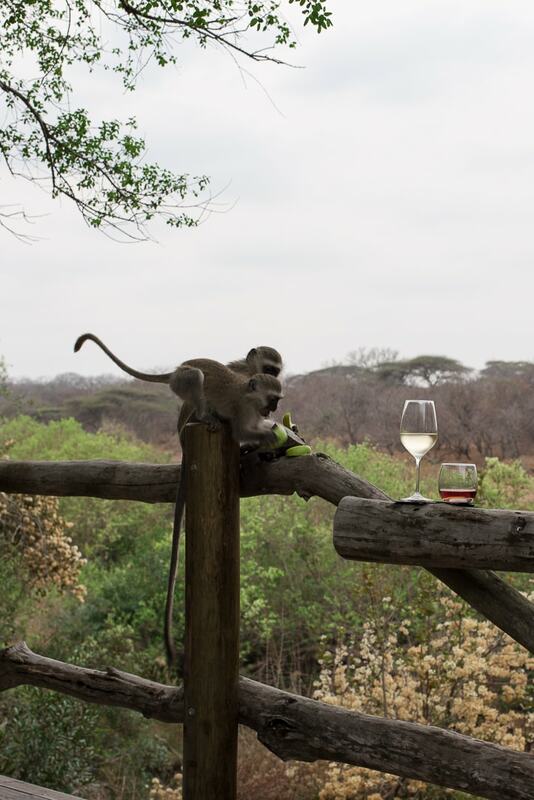 It is incredibly funny to watch monkeys from the big panoramic windows or to enjoy a high quality wine from the mini bar on your own terrace. 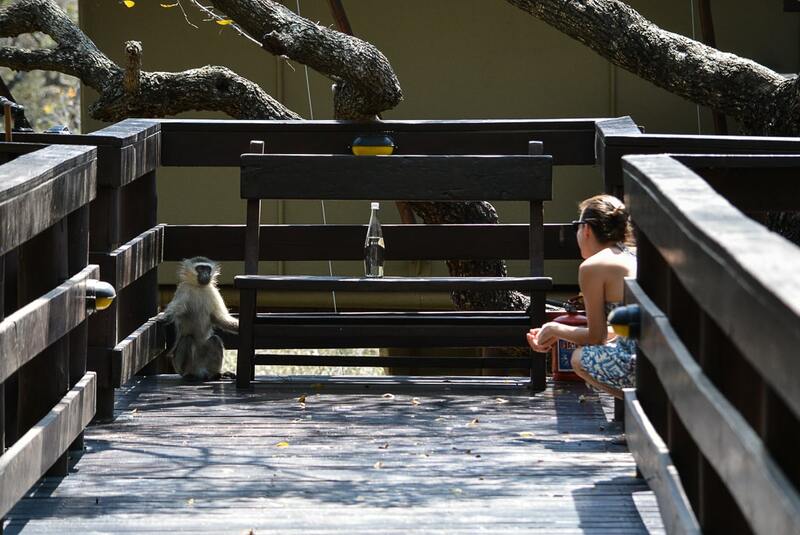 Or to even sit with the monkeys on the terrace. 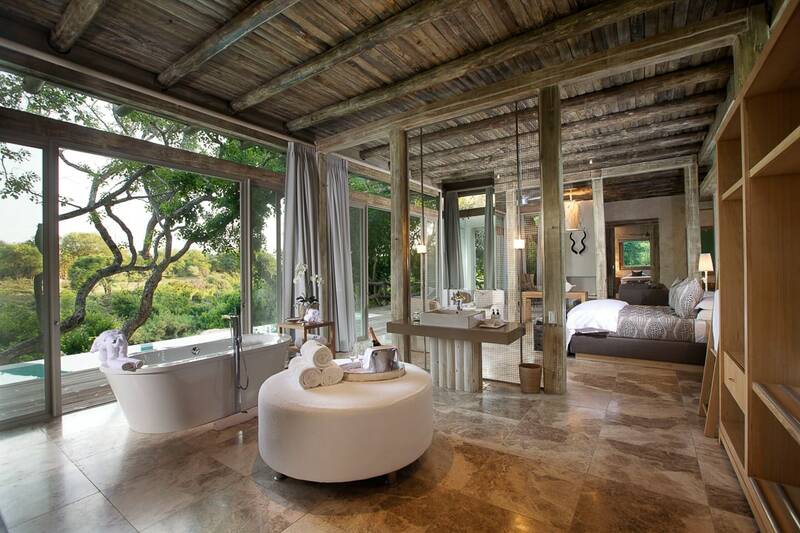 With an outdoor shower and a spacious indoor shower one can treat oneself after the Game Drives. 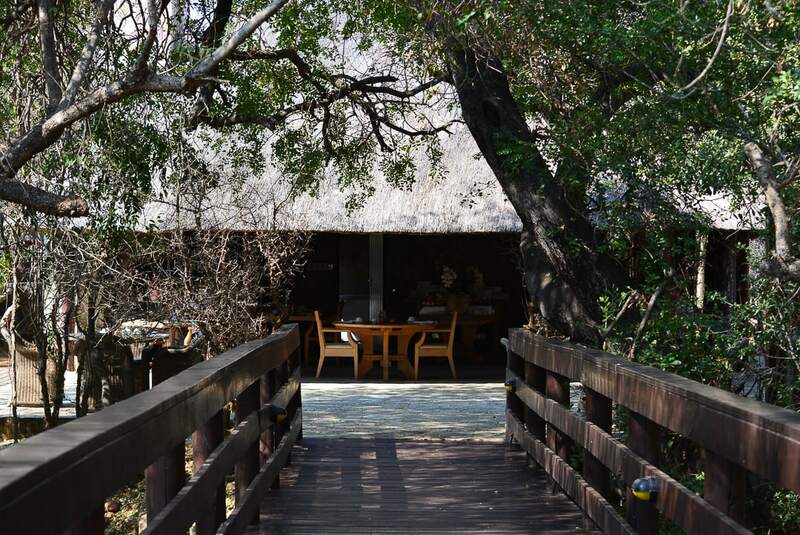 The accommodation is really very big and one can enjoy the bush relaxedly and reclusively. For romantic people and those who would like to experience something special it is a very exciting adventure! 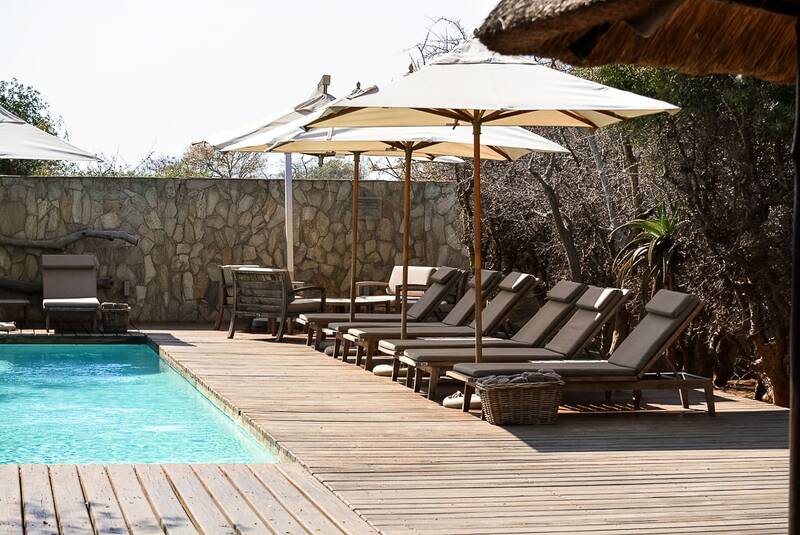 On the Game Drives a group usually consists of 6 people, that’s why it is nice to later have some private time off in the elegant villa. If you like, you can also relax at the bar and the amazing observation deck. From time to time you meet other guests that you can exchange thoughts with. 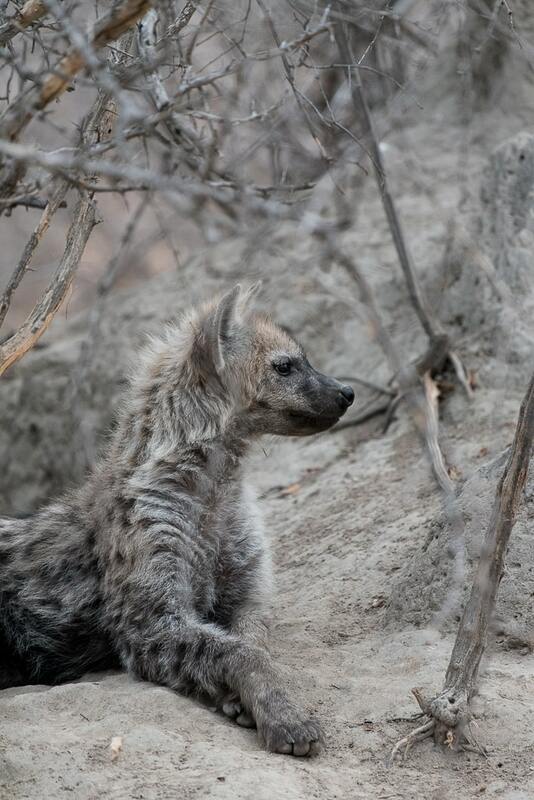 Everybody talks about his or her experience in the bush and very often one exchanges contact details. 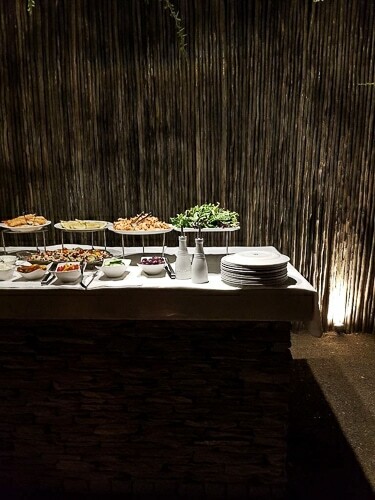 I would like to especially set apart the cuisine of Kapama Karula. 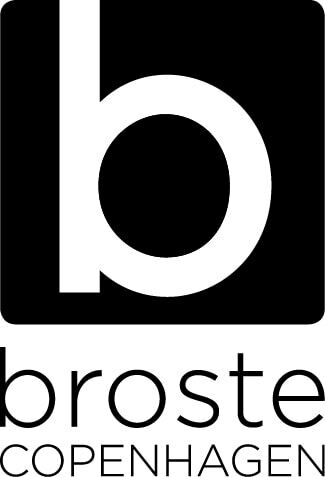 Every requirements, allergies and specialties are being taken into consideration by the team. As I am allergic to garlic and my husband is allergic to citric acid it is often very difficult for us to dine out. In Karula everything was discussed up front and we could enjoy the good cuisine without any worries. 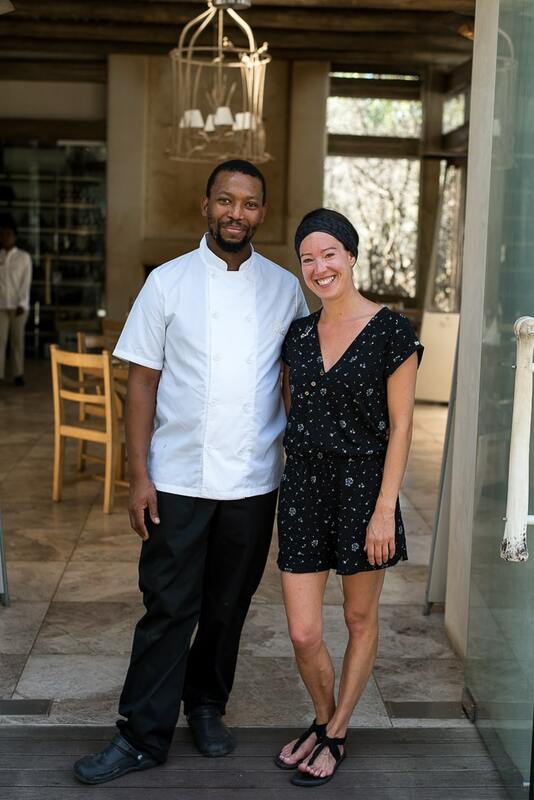 The chef Makhi is a 34 year old South African who radiates an incredible passion for cooking. The whole team is unbelievably cordial and leaves nothing to be desired. I was especially happy that Makhi shared his recipe for a smoked tomato risotto with me. You will find the recipe in the image series. The extended breakfast consists of freshly baked bread (partially even whole-grain bread), fresh fruit, selfmade compotes (e.g. quince compote), egg dishes, quiche and a big variety of extra-ordinary kinds of cheese. 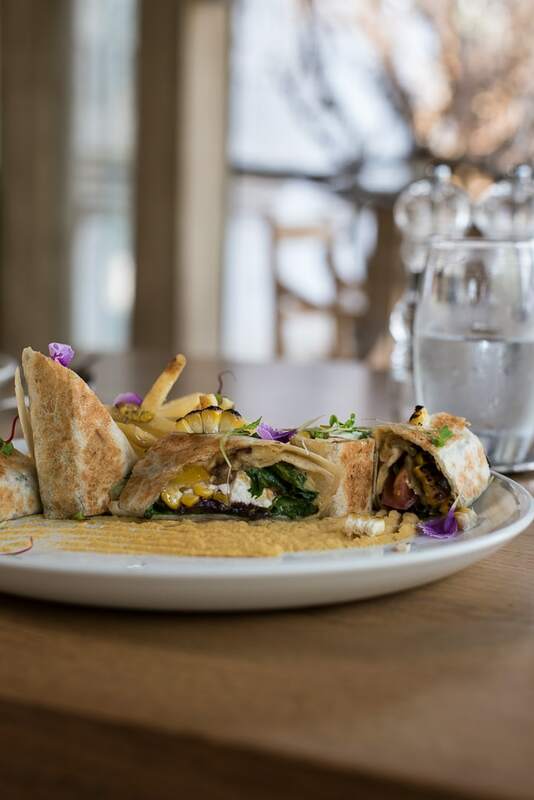 According to your wishes you additionally order a warm dish such as crepes, waffles or eggs. A feast for the senses! At lunch there is a big variety (3 courses). One can choose between soups or different salads as a starter, pasta, burgers, sandwiches, wraps or meat dishes as a main course and desserts or a cheese platter as the last course. No matter what one orders all of the ingredients are incredibly fresh, the food is always amazingly presented and tastes wonderfully! 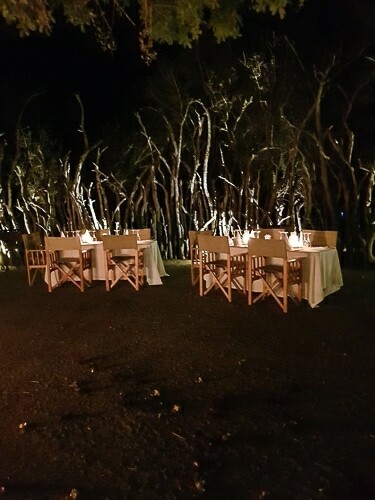 After the evening game drives there is an a la carte dinner or a 6 course tasting meal in the elegant restaurant at half past seven or a BBQ in the boma. During the tasting dinner 6 different very good wines are being served with dinner. This wine journey has especially impressed us.The dinner in the boma is of course always something special. On the third day we met our group from the safari vehicle for a joined BBQ under the beautiful starry sky by the campfire. It was a very funny and very special evening with our group (consisting of 2 Brazilians and 2 Americans). One meets so many incredibly great people on safaris! They are all different but still the same. All oft hem love nature and respect animals. We all want to get to know more and take part with all of our hearts. 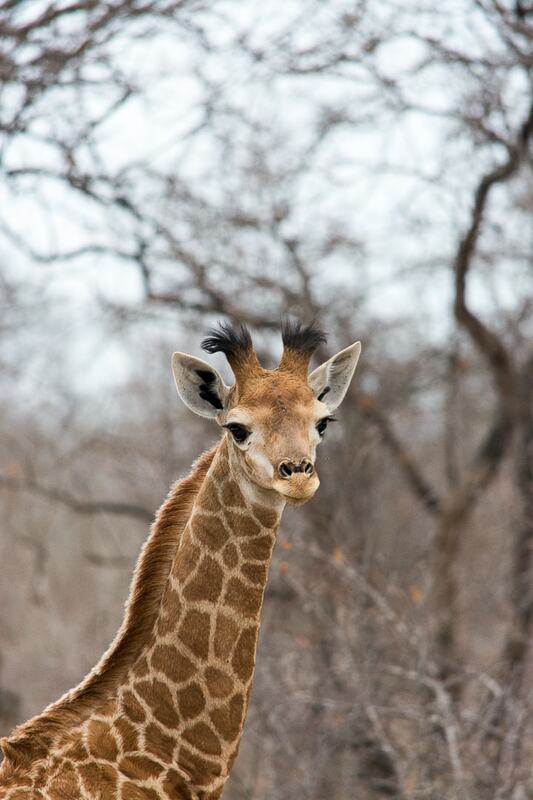 “I am not the same Person anymore since I experienced my first game drive in the South African bush!”– 😉 Janine Hegendorf, Bloggerin. Safari Game Drives touch my heart so deeply. The reason why we travel to Africa almost every year! There is so incredibly much to discover and it is always very exciting to get into an open land cruiser after the first coffee or tea early in the morning to drive towards the sunrise. The fresh and clean air, the sounds of wild nature are amazing! No other feeling can be compared with that one experiences when one gives oneself to nature and is being enclosed by the rough and wild Africa. The land cruiser offers room for 9 people at the maximum. Yet in Buffalo and Karula the vehicles will be manned with 6 people at the maximum which is very comfortable as this provides enough space in the vehicle. There are 3 different types of seats in the land cruiser. 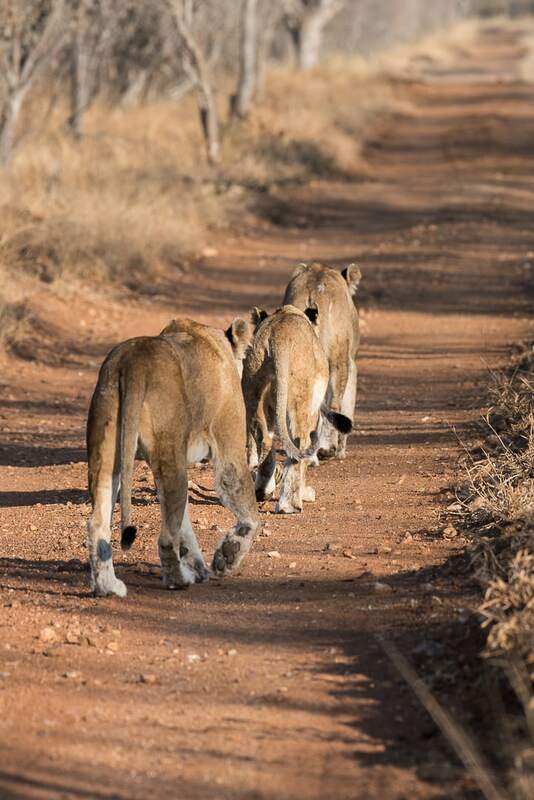 Directly behind the ranger and the tracker, in the middle or at the back. We like varying while we also like sitting in the front because of our photographs and the big objective. 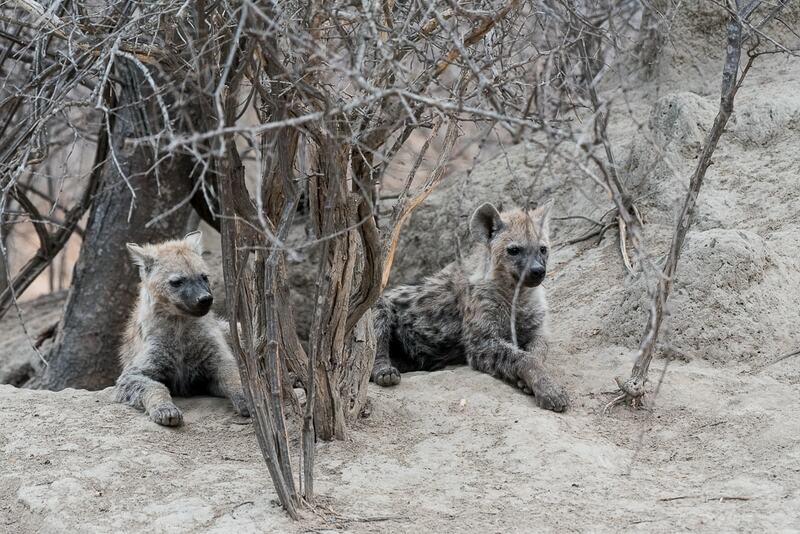 It’s not usual that you see all of them when you are on safari! 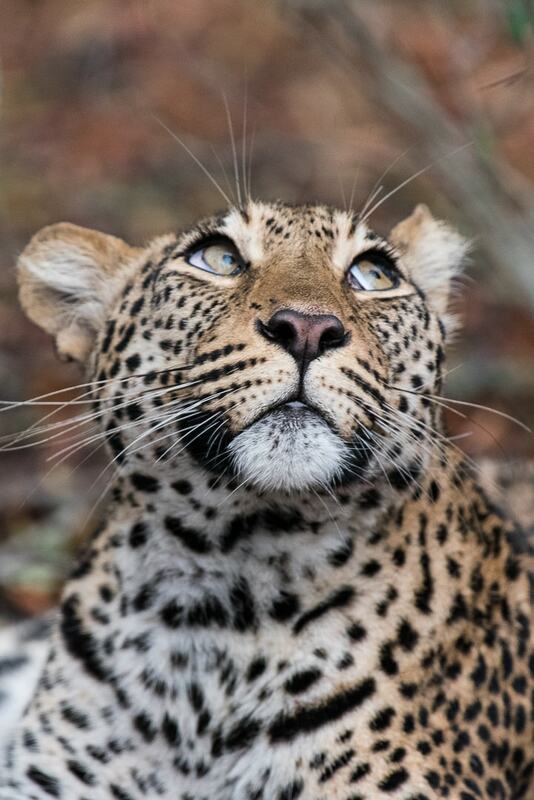 We are of course especially interested in the leopard. Always 😉 One does not immediately count on seeing this well camouflaged creature. 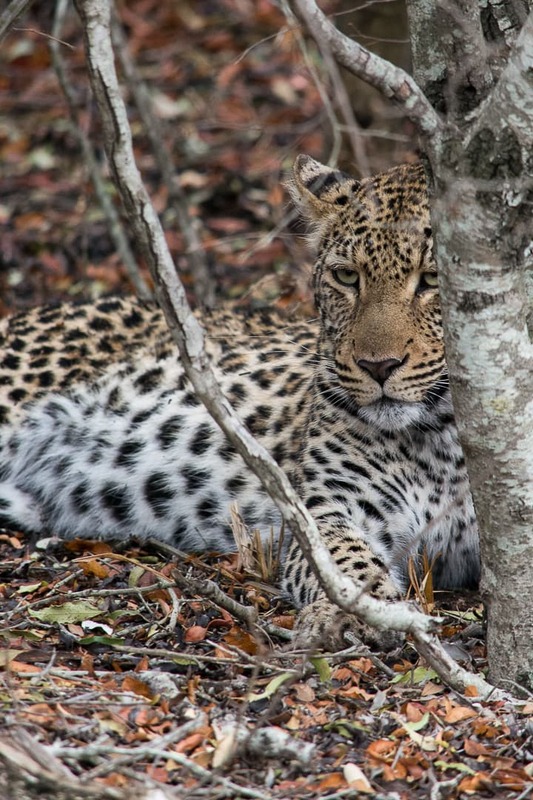 One drives and drives, searching the dense bush for movements and sounds and is totally amazed when suddenly discovering a leopard in the covert. Our ranger Ruan leaves the road and fights for his way. We are not allowed to stand, keep very quiet. 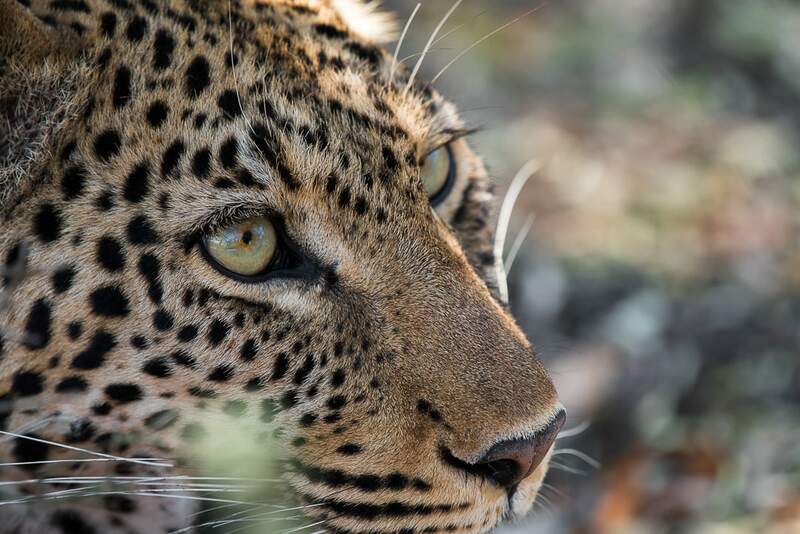 The leopard watches us with his fascinating look but remains lying because the prey hangs in a tree in a distance of only 2 meters. He protects it. We stop to silently enjoy the moment which engraves itself deeply into our soul. 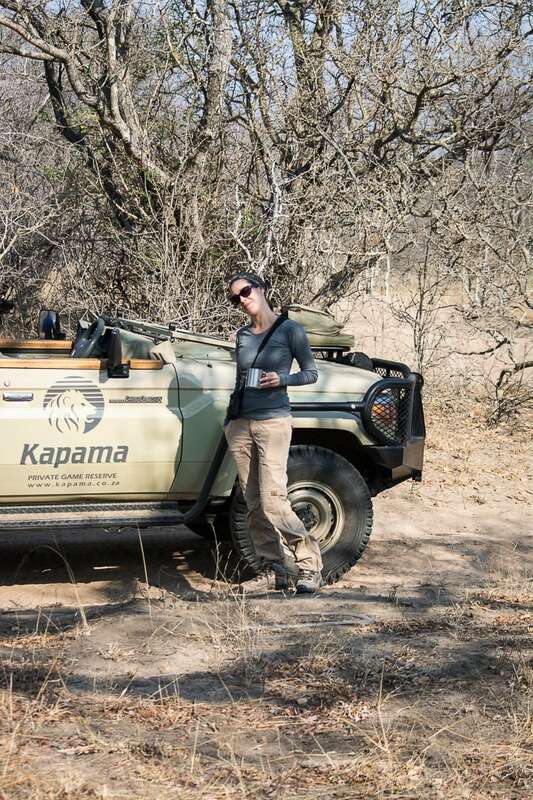 A very special highlight of the day is the morning coffee in the middle of the bush. The ranger chooses a nice spot, he quickly searches the surrounding on foot for wild animals before building a small coffee table with snacks which we help ourselves from. Always within view of the ranger, of course! In the evening the sundowner is unbeatable. 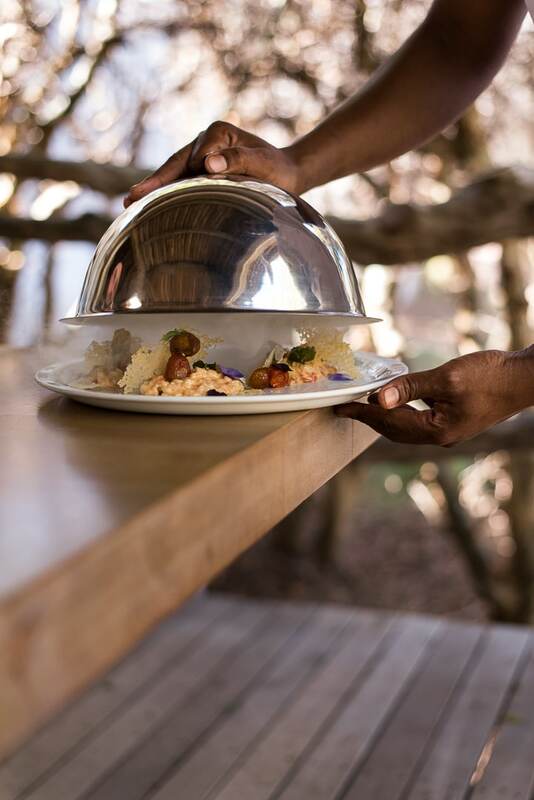 The same procedure as in the morning, except for being served with wine, spirits and beer while enjoying the breathtaking sunsets in a small circle. 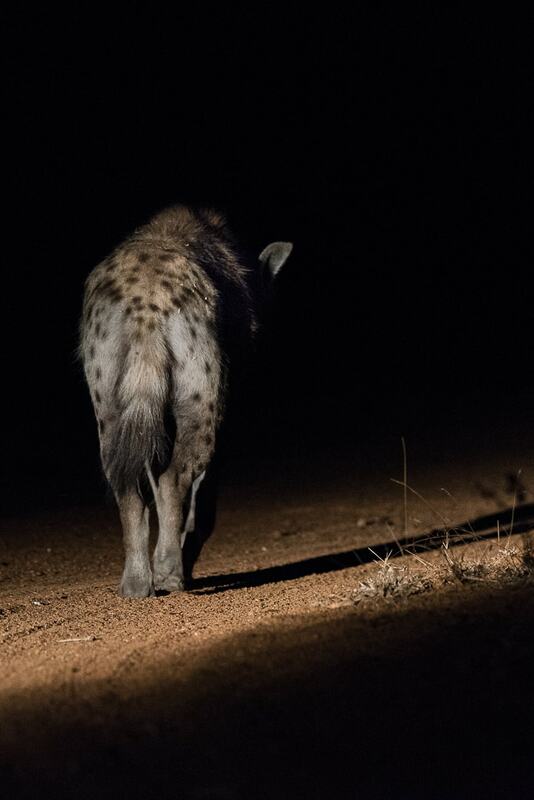 It was an absolute highlight to be surprised by a hyena while enjoying a sundowner. We were just talking to our tracker Nickolaus and in the next moment he quietly hinted at a harpy that was watching the scene from only a few meters away. Very quietly we were allowed to stay outside the vehicle to watch the harpy curiously pass us by. After the sundowner one drives into the night. 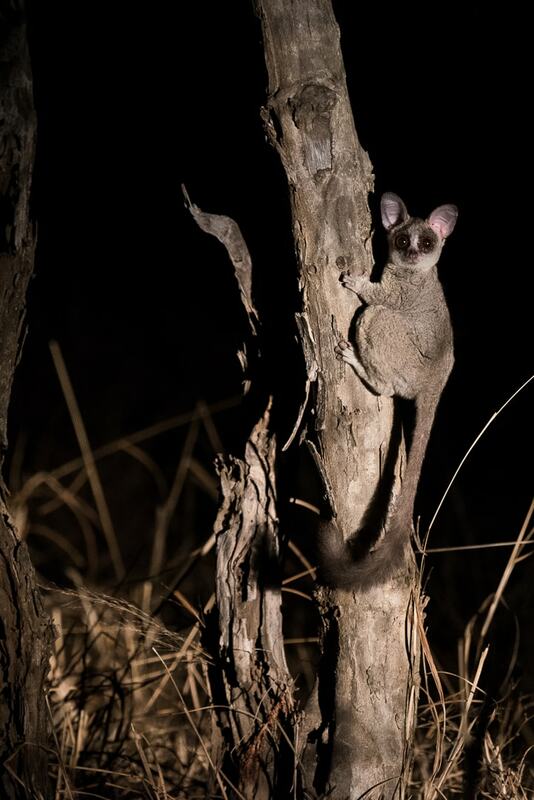 It gets dark very early already and with the help of a spotlight the ranger and the tracker look for nocturnal animals. 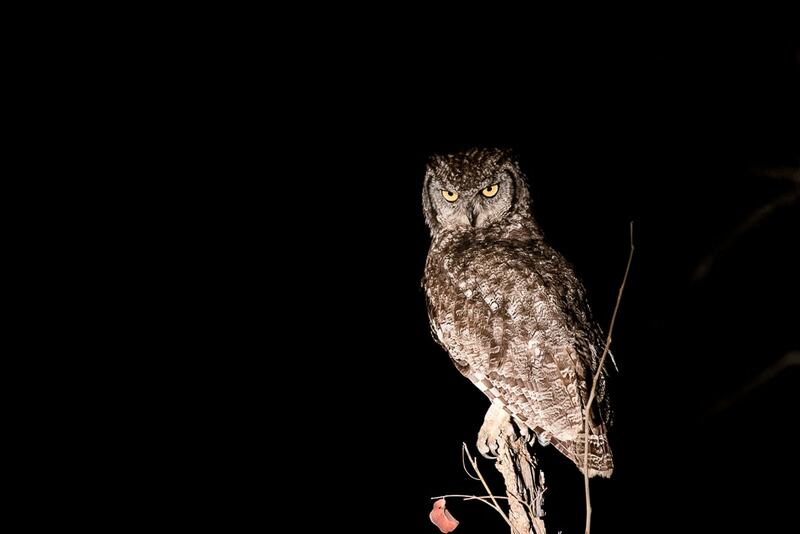 Bush babies and owls are only two of the species one can watch at night. After a 3 hour game drive and a rich breakfast one can treat oneself in the Karula Spa. 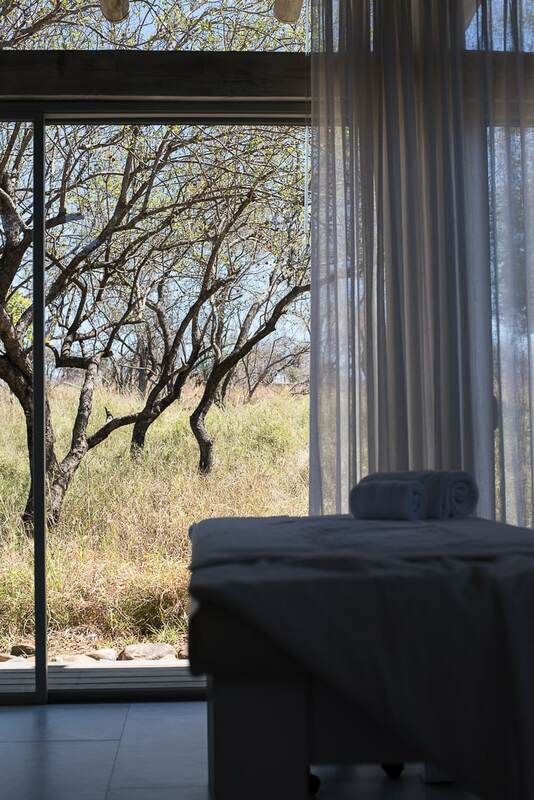 Numerous African treatments such as the African Rungu massage take one’s thoughts back tot he adventurous trip. Very relaxedly one can let the unutterable moments pass by and give body, skin and soul a treat. During the 60 minute Rungu Massage that I enjoyed a wurfklub is being used. This is an even rounded wooden slat that stimulates the blood circulation. Combined with the hands a very useful method of massage. The Karula Wellness Center provides a pool and a steam bath. The view into the African open takes one’s breath again. Who is keen on sports (I wasn’t ;-)) can let off steam in the gym. 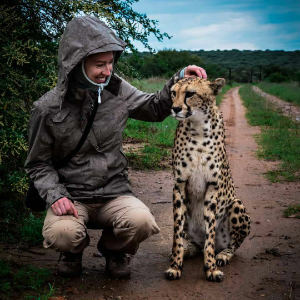 „The only man I envy is the man who has not yet been to Africa – for he has so much to look forward to.“ – Richard Mullin, US American singer and songwriter.. I can still remember many single moments of my safaris after. One thinks that time is standing still. 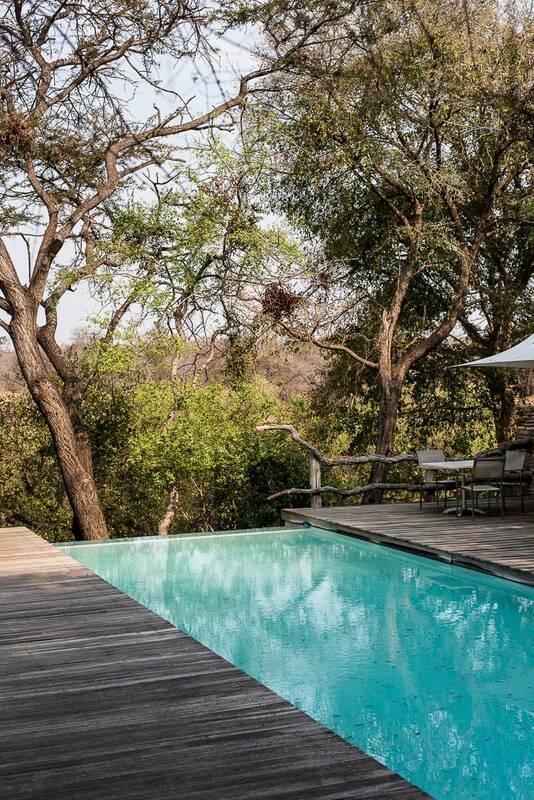 In the middle of nature, surrounded by the magic South African wildlife. It is like the people say. Africa once, Africa forever. At least for me. There is not a place in the world that is more beautiful (except for my home, of course ;-)). This is exactly the reason why I / we are attracted by this continent again and again. This year our safari was a bit shorter but felt much longer because of the numerous adventures. 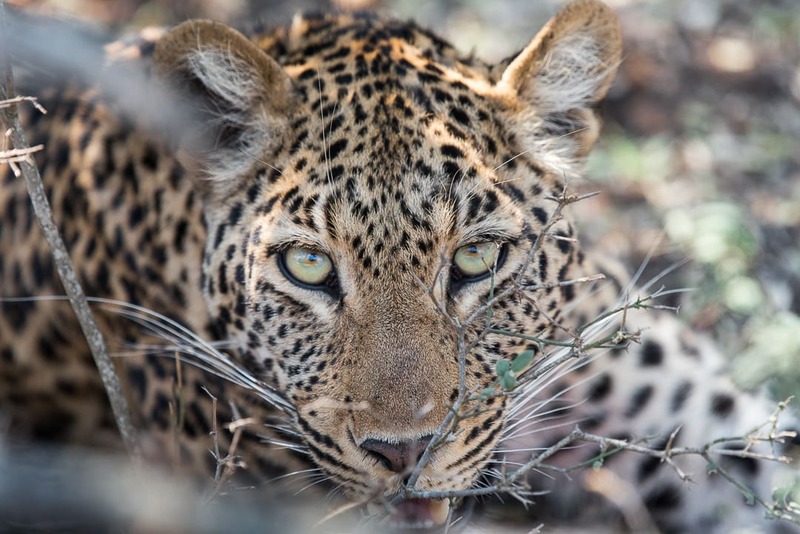 No matter if one wants to be on safari in the bush for a few nights only or for several days, one can watch the Big Five and other amazing wild animals. We have made our best experience with rangers / guides who know the flora and fauna of Africa well. As selfdrivers we would never have discovered so much as with an experienced ranger tracker team. 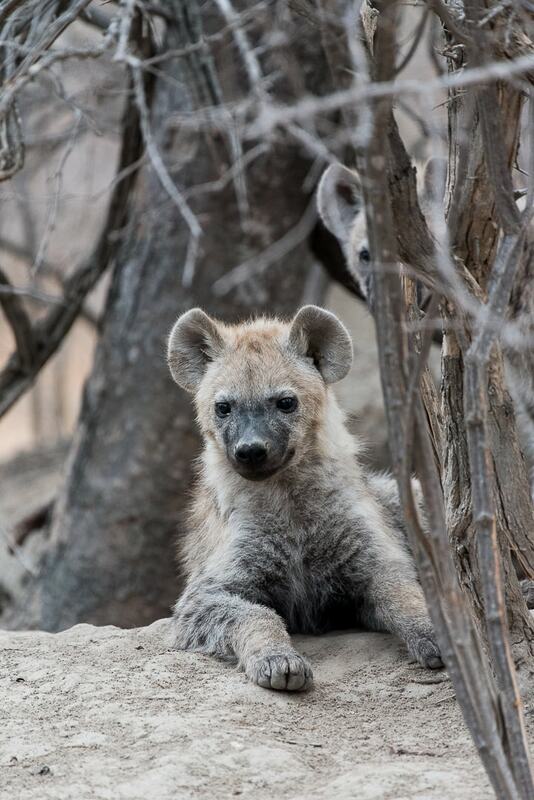 As we have been to Kapama Private Game Reserve 3 times already, I can assure you that you will get your money’s worth. 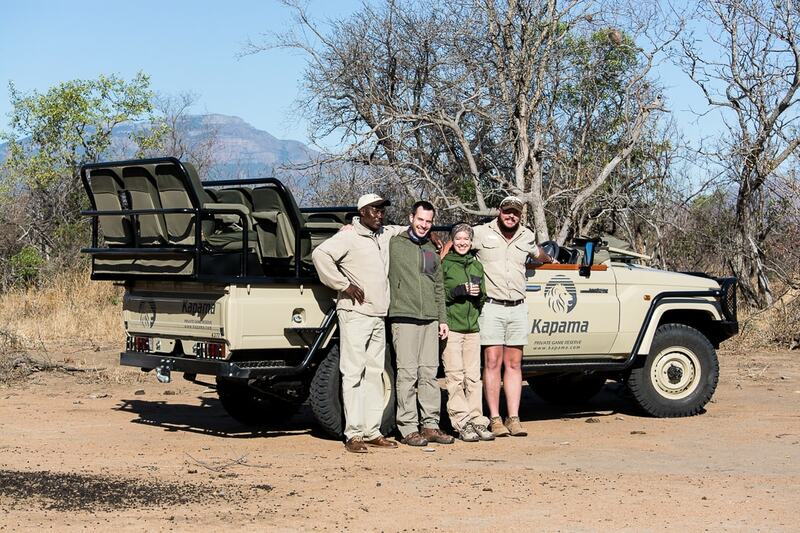 A huge Thank You to the whole Kapama Private Game Reserve Team that has brought us an unforgettable safari holiday. 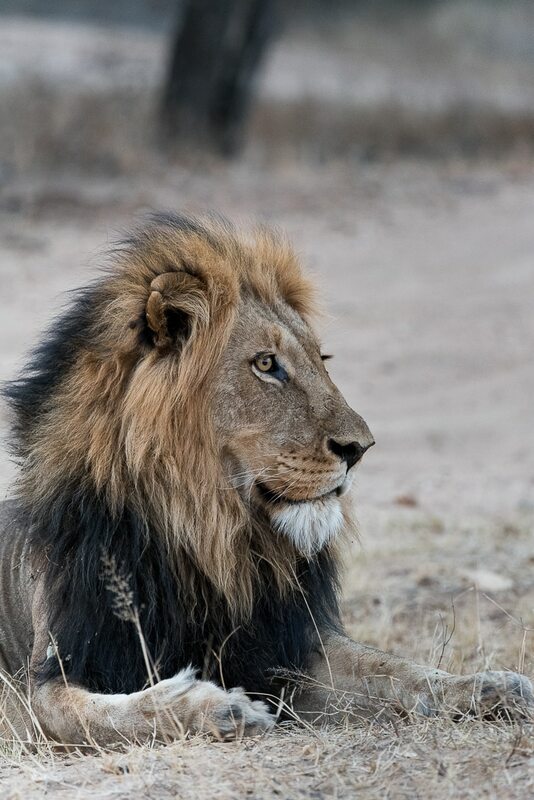 Many thanks to Ben and Sunnyboy, Ruan and Nickolaus for the breathtaking game drives, the little and big adventures at water holes and in the dense bush. To Claire and Sharice for the cordial welcome, to Reason, Loveness and Godfrey for the unbeatable good service. To the chef Makhi who always patiently answered my questions about his extraordinary recipes and who should be awarded with a star for his creative cuisine. 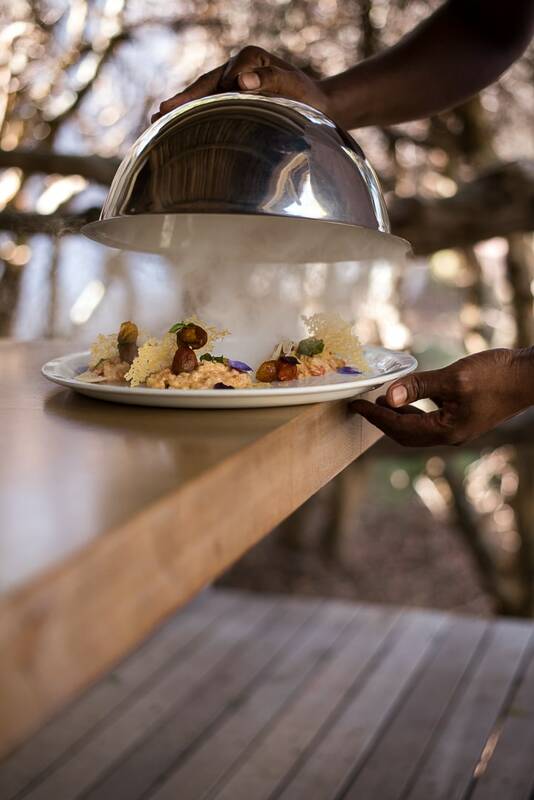 To the whole kitchen team that daily offered explosions of flavours and to Nicole who made it possible for us to exclusively take you onto this animal holiday and to report about it in my social media account.